Best of Dusty Watch highlights from the 2016 Jack Dyer Medalist Dustin Martin. Dynamic Richmond midfielder Dustin Martin automatically qualifies for life membership of the Club, when he reaches the 150-game milestone in Friday night’s clash with Collingwood at the MCG. Martin, who started playing senior football with Victorian country club Castlemaine as a 16-year-old, was Richmond’s first pick (No. 3 overall) in the 2009 AFL National Draft. His coach at Castlemaine was former Richmond, Fitzroy and St Kilda wingman Jamie Elliott. When Martin was drafted by the Tigers, this is what Elliott had to say about him . . .
“He’s just a powerful, powerful kid. I used to do one-on-ones with him as a 16-year-old and he would just push me off the ball. “I thought he could have played senior AFL football this year as a 17-year-old, no doubt. “I’ve never seen a kid run into a pack of six or seven men and come out backwards with the ball . . . it’s not as though he was running through the pack, he would run in like a bull, grab the footy and run out backwards. At the time, Richmond recruiting manager Francis Jackson explained why the Club had been so keen to take Martin with its first pick in the ’09 National Draft . . .
“Dustin has been on our radar since last year. He is a special talent and we have tracked him closely,” Jackson said. “We knew last year that he would go top five in the Draft. He has improved even further over the past year and had a stellar performance at the under-18s national carnival, which culminated in him being named in the All-Australian side (in the centre) . . .
“He is unbelievably football focused,” Jackson said. “Despite leaving school early, he has had terrific life experiences and is a very hard worker. “He is a nice country kid, very humble, but has a fanatical desire to be the best he can. “When we told him we were taking him at pick three, he wanted to come to training on Friday and he was gutted to find out the players had the day off and wouldn’t be resuming training until Monday. It’s fair to say Martin has well and truly lived up to the hype that surrounded his arrival at Tigerland, as an 18-year-old, late in 2009. Martin made a promising senior league debut with Richmond in Round 1 of the 2010 season against Carlton at the MCG (18 disposals, four marks) and played 21 games all-up that season, finishing an impressive fourth in the Jack Dyer Medal (the Club’s Best and Fairest award). Since then, Martin has gone from strength to strength. He has been runner-up in the Best and Fairest twice (2013 and 2015), third on two occasions (2011 and 2014), and now is a raging hot favorite to take out his inaugural Jack Dyer Medal following an outstanding season in a struggling side. Having assumed more responsibility within the Tigers’ line-up, in a full-time midfield role this year, Martin is averaging 30.6 disposals, 13.1 contested possessions and 5.5 clearances per game. When you consider the fact he’s picked up 30 disposals or more in a match on 30 occasions throughout his career at Richmond, with 10 of those happening in season 2016, it’s clear just how influential he’s become. Former North Melbourne champion, Wayne Carey, acknowledged as one of league football’s all-time greats, was glowing in his assessment of Martin’s growth as a player at the game’s highest level, during an article he wrote for ‘The Age’ newspaper a few weeks ago. “He's now the most dynamic and damaging player at the Tigers. Along with Patrick Dangerfield and Buddy Franklin, Martin is one of the most exciting players in the league to watch,” Carey declared. “I'd go so far as comparing him to (former Adelaide champion) Mark Ricciuto. Like ‘Roo’, he's an absolute bull and is almost impossible to tackle. He's more aggressive at the footy than ever, has the best ‘don't argue’ in the game, and is relishing his move into the middle. “He can win his own ball, break tackles and then burst clear. “By the same token, Martin's still a real asset up forward, given he rarely gets beaten one-on-one. Kick it in his direction and he either breaks even or is having a shot at goal – even the best defenders wouldn't look forward to an afternoon on Martin. “The knock on him in the early part of his career was his tendency to fade-out in the second half of matches, but he appears much fitter and seems to be covering the ground better. “The Tigers have demanded more of him and he's done everything that's been asked. 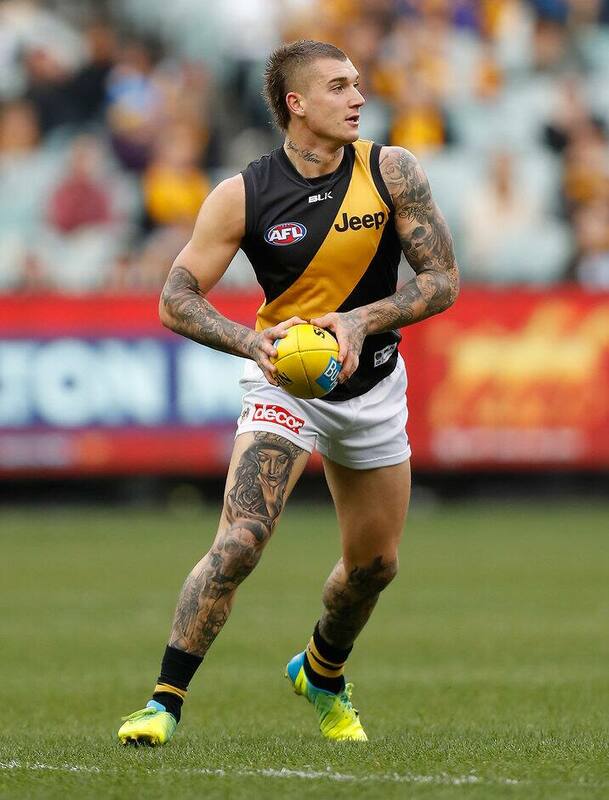 And, you get the feeling that, at just 25 years of age, Dustin Martin’s star is still on the rise, which is an exciting prospect indeed for the Tiger Army.